Using the same expertise they've employed to build new organs for patients, scientists at Wake Forest Institute for Regenerative Medicine and colleagues have engineered micro hearts, lungs and livers that can potentially be used to test new drugs. By combining the micro-organs in a monitored system, the researchers aim to mimic how the human body responds to medications. The goal of the effort, known as a "body-on-a-chip," is to help reduce the estimated $2 billion price tag and 90 percent failure rate that pharmaceutical companies face when developing new medications. Drug compounds are currently screened in the lab using human cells and then tested in animals. But neither of these methods adequately replicates how drugs affect human organs. "There is an urgent need for improved systems to accurately predict the effects of drugs, chemicals and biological agents on the human body," said Anthony Atala, M.D., director of the institute and senior researcher on the multi-institution body on a chip project, funded by the Defense Threat Reduction Agency. 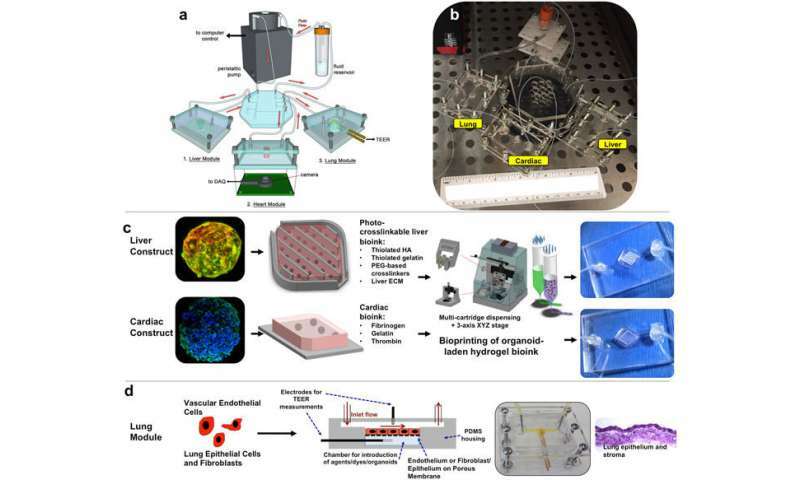 In Scientific Reports, published by Nature, the research team reports success engineering micro-sized 3D organs, known as organoids, and connecting them together on a single platform to monitor their function. While other teams have combined cells from multiple organs in a similar system, this is the first reported success using 3D organ structures, known to be higher functioning and to more accurately model the human body. The organ structures were made from cell types found in native human tissue using 3D printing and other methods. Heart and livers were selected for the system because toxicity to these organs is a major reason for drug candidate failures and drug recalls. Lungs are the point of entry for toxic particles and also for aerosol drugs, such as asthma inhalers. "The data shows a significant toxic response to the drug as well as mitigation by the treatment, accurately reflecting the responses seen in human patients," said Aleks Skardal, Ph.D., assistant professor at Wake Forest Institute for Regenerative Medicine, who represented the multi-investigator team as the lead author of the paper. "If you screen a drug in livers only, for example, you're never going to see a potential side effect to other organs," said Skardal. "By using a multi-tissue organ-on-a-chip system, you can hopefully identify toxic side effects early in the drug development process, which could save lives as well as millions of dollars." The scientists conducted multiple scenarios to ensure that the body-on-a- chip system mimics a multi-organ response. For example, they introduced a drug used to treat cancer into the system. Known to cause scarring of the lungs, the drug also unexpectedly affected the system's heart. However, a control experiment using only the heart showed no response. The scientists theorize that the drug caused inflammatory proteins from the lung to be circulated throughout the system. As a result, the heart increased beats and then later stopped altogether, indicating a toxic side effect. Scientists are working to increase the speed of the system for large scale screening, and also to add additional organs. "Eventually we expect to demonstrate the utility of a body-on-a-chip system containing many of the key functional organs in the human body," said Atala. "This system has the potential for advanced drug screening and also to be used in personalized medicine - to help predict an individual patient's response to treatment." Several patent applications comprising the technology described in the manuscript have been filed.